wanderlust ATLANTA: OUMA's "Optic Chiasm"
Optic Chiasm: The Crossing Over of Art & Science is brilliant! A joint venture with the Atlanta Science Festival, Atlanta Science Tavern, and Oglethorpe University Museum of Art (OUMA), the exhibition is an exploration of the art of vision and the science of sight. I knew from the first time I heard about the exhibit that it was a must-see! There are two consecutively running exhibitions, both part of this year's Atlanta Science Festival, which wrapped up yesterday. The OUMA exhibits will continue to be on display through Sunday, May 4, 2014. I'd like to interject a huge "Thank you and congratulations!" to the Atlanta Science Festival. They had phenomenal programming and how fantastic that they included the Oglethorpe University Museum of Art! I'm showing you only a few of the pieces in Optic Chiasm, and the photographs do not do justice for how incredible the actual pieces truly are. But as usual, I want to save something for you to experience in person. When you're planning to see the exhibit, consider going on a Wednesday evening in April. There's a lecture series coupled with the current exhibitions. The one I'm particularly interested in attending is "How the Art You See Depends on the Physics Your Brain Knows", presented by Dr. Michael K. Rulison, Professor of Physics, Oglethorpe University. The above piece is one of three in the exhibition by artist Allan Eddy. Eddy is an award-winning 1988 graduate of the Atlanta College of Art. In 2000, stricken with meningitis, he went totally blind overnight. Years later, to the great surprise of a number of doctors, he has regained a small portion of sight in one eye, as well as some color distinction. Atlanta-based Eddy continues to paint today. Eddy will be presenting a lecture at the Museum on Wednesday, April 30, at 7:00 p.m. titled, "Painting in the Dark"...another must-attend. 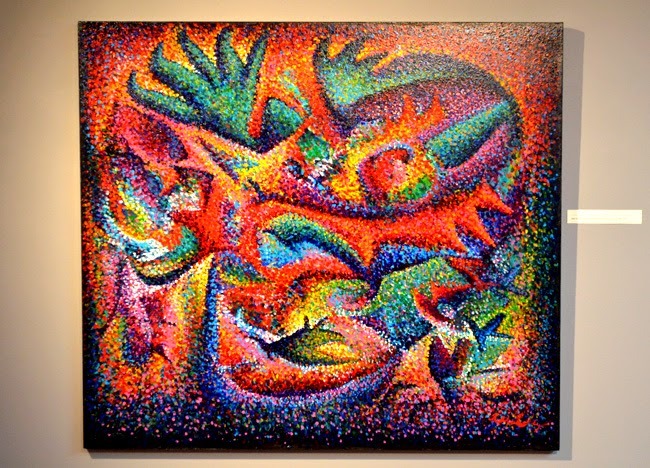 Pictured above, Flora and Fish represents Eddy's current style of art—abstract/surrealism in pointillism. Optic Chiasm was coordinated by Ms. Nancy Lowe, Director, Symbiosis Art+Science Alliance; Dr. Nicole Gerardo, Assistant Professor of Biology, Emory University; and the lovely Ms. Elizabeth Peterson, Director, Oglethorpe University Museum of Art. 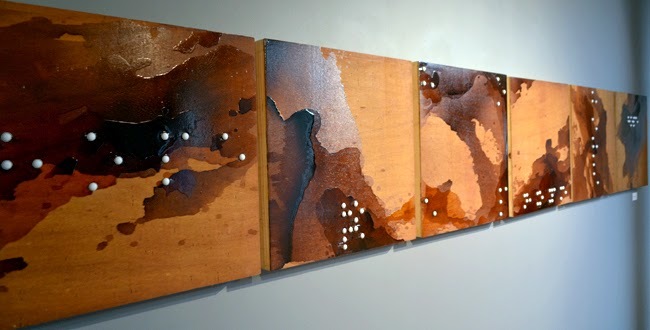 Many of the pieces in the Optic Chiasm exhibition are coupled with "Please Touch" signs. You don't see that every day and it brings a level of connection with the works that non-tactile interaction just can't. A departure from the Museum's 17th Century paintings and Japanese porcelains, I offer high marks for such an impressive departure...these exhibits and all they represent are phenomenal! 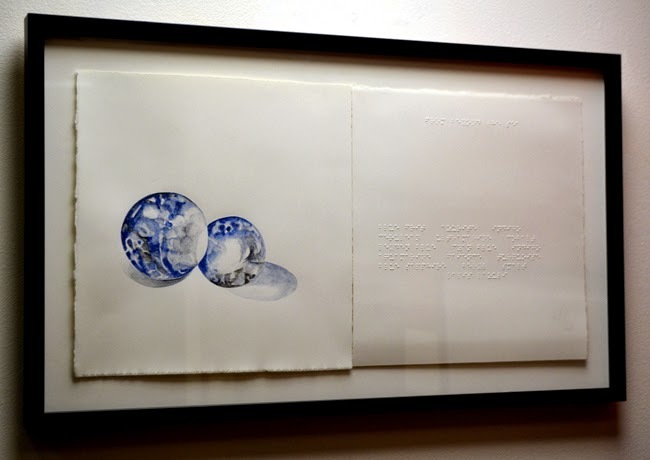 The above piece, one of three in Marcia R. Cohen's Out of the Blue series, was my personal favorite in the Optic Chiasm exhibit. The panel on the right is a literary description—in braille—of the painting. I once tried to learn braille, but didn't have the required patience—for someone in the 6th grade anyway. Instead, I started learning American Sign Language. I never became proficient, but can laboriously carry on a conversation in Sign. I think those early experiences contribute to my fascination with an exhibit of this nature, but I hope the above preview piques the interest of everyone. Optic Chiasm: The Crossing Over of Art & Science is definitely worth a visit and do consider attending one of the OUMA lectures.